Andrew Webb, the man in charge of children's services at Stockport Council and vice-president of the Association of Directors of Children’s Services (ADCS), scares the hell out of me. The Vale View toxic waste dump school does not hold any Asset Management Plans (AMP). Hence, Transparency, Accountability and Security (TAS) CANNOT be achieved . I understand the Principle Contractor(BAM) for the is certified to the ISO9000 series, but in the event there are no ABD or AMP, I would question the honesty and integrity of BAM and their external auditors. In the event they do not hold any As Built Drawing (ABD) the school is operating in a legal void because it is a Legal Requirement to hold ABD. "Adoption map, published by the government which shows the number of children waiting to be adopted in different parts of England. A new telephone information and advice service staffed by adopters will also open today. The map is a crude measure and whilst we understand the rationale for this map, it is not a proportionate analysis and cannot be used to judge "good" or "bad" authorities. The Department for Education have stated that it is not a judgement on local authority performance and should not be used as such. The map does not give a full illustration of a complex and moving picture, but we hope it will help illustrate that there are still children waiting to be adopted in every part of the country and encourage those who are interested in adoption to come forward." Who is the Director of Children's Services at rogue Stockport Council? Andrew Webb! So, Andrew Webb blocks questions on a school to be built on unremediated toxic waste with financial irreguarlities of circa £5 million which was deliberately built too small in multi-million pound offence under the Fraud Act 2006 against the council taxpayer. He says for a simple primary school that it will take 84 hours of council officer time to "redact" all the secrets involved with this project. This was a current project at the time. He should have had all the relevant information at his fingertips. He lied about the work involved in releasing this information to a council taxpayer who was perfectly entitled to ask. He still blocks all information on this development being released to me. There should have been replacement playing fields at a cost of £280,000. They are not there and never will be. Is Mr Webb a suitable person to hold public office, never mind act as an advisor on all sorts of committees? The Fraud Act 2006 defines fraud as activity aimed at securing a gain, causing a loss or exposing somebody to risk of loss, through false representation, failing to disclose information or through abuse of position. "After completing a degree in psychology and sociology, Andrew qualified as a teacher and a social worker. He has been employed in a number of local authority posts since 1976, working predominantly with children and families. He was previously Director of Children’s Services and Director of Social Services in Stockport, and responsible for children and families services with both Knowsley Council and Cheshire County Council prior to that. Andrew was Deputy Chair of the Government’s Social Work Task Force in 2009/10, a member of The Independent Commission on Youth Crime and Antisocial Behaviour established by the Police Foundation, and is currently chair of the Research in Practice partnership board and a member of the newly created Family Justice Board. Andrew’s contribution to national policy has included a secondment as an adviser to the DfES to help develop the change programme supporting Every Child Matters and the Children Act 2004 and membership of a number of Government inter-departmental steering groups that produced guidance on safeguarding children, services to children in need and reducing delay in family proceedings. He was a member of the NSPCC working party that published ‘Which of You Did It?’ in 2002 and in 2004 was part of a working group chaired by Baroness Kennedy and sponsored by the Royal Colleges of Paediatrics and Pathology which produced a national protocol for the investigation of Sudden Unexpected Deaths in Infancy." "Central and local government should be cautious about modelling provision for vulnerable young people on international examples, the children’s commissioner for England has warned. Speaking at a debate about children in care at the National Children and Adult Services Conference, Maggie Atkinson told delegates that decision-makers had to be “really careful” when analysing the merit of international comparators. Her comments came in reponse to Andrew Webb, vice-president of the Association of Directors of Children’s Services (ADCS), who suggested that approaches used in Finland and Sweden could potentially be applied to children and young people in the UK. “We are, as a nation, brilliant by being seduced by what they’re doing in Finland, Sweden and elsewhere,” Atkinson said. “No, they don’t put their children behind bars in Sweden, they put them in secure mental hospitals. Talk to my commissioner opposite number – she’ll tell you. They drug them, they restrain them and they lock them up. Webb defended his position, arguing that international approaches should be used as evidence to inform policy, rather than being directly imported. “Looking at the evidence isn’t the same as adopting what’s going on,” he said. “If there are different models of doing things, we need to understand what the consequences of adopting them might be and look at potential unintended consequences, but we should never close our lines to what’s going on elsewhere. Earlier, Webb told delegates that ADCS is planning to commission research into international evidence on interventions with vulnerable adolescents. He suggested that Finland and Sweden’s approach leads to fewer adolescents being put into custody. I am writing in response to your email below in which you asked what service improvements have been implemented within CYPD as a result of complaints received. Across the wide-ranging services within CYPD, including schools, social care and other support services, regular discussions take place to identify any actions that may be necessary in response to a representation or complaint. To provide information to you in relation to every complaint received by schools and services would involve contacting all parties to the complaints in order to identify what actions and improvements were taken. This would take a considerable amount of time. 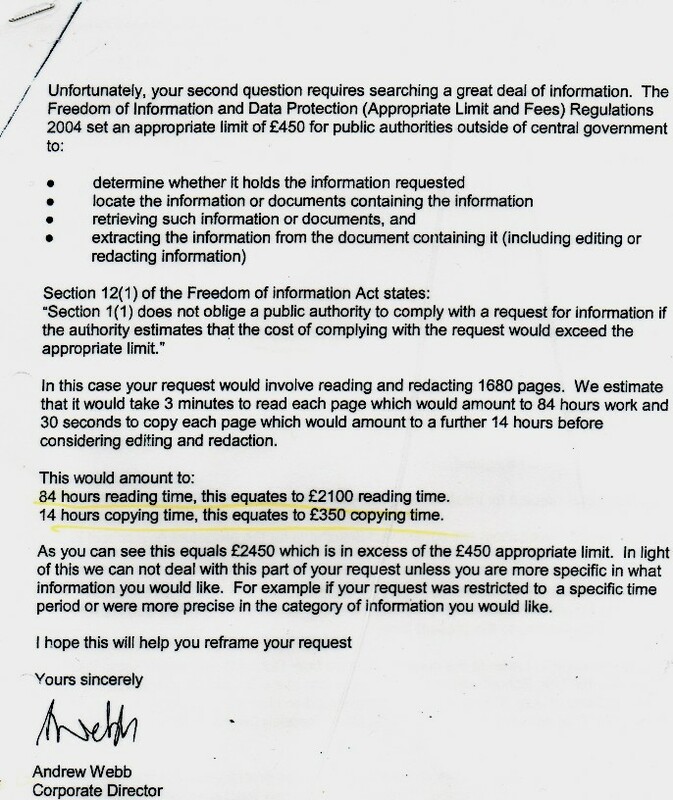 As you may be aware, under section 12(1) of the FOI Act public authorities such as Stockport Council are not obliged to comply with requests for information if they estimate that the cost of complying with the request would exceed the ‘appropriate limit’. The Freedom of Information and Data Protection (Appropriate Limit and Fees) Regulations 2004 set an ‘appropriate limit’ of £450 for public authorities outside Central Government, which equates to 18 hours’ work at a statutory rate of £25 per hour. We estimate that determining whether we hold the relevant information then locating, retrieving and extracting it would exceed this limit; therefore we have not provided you with this information. Following a complaint in relation to the placement of a young adult – it led to an appraisal of review meeting timescales to ensure appropriate provision was planned in a more timely fashion for care leavers. Following a complaint about a school trip – the governing body at the school made changes to the school’s policy on risk assessments. Please see the attached from the current Council Plan. Not only is the Children and Young People's Department getting a lot of complaints, it is also doing quite badly when one looks at the performance indicators. I assume the many complaints are due to the fact that the Department is performing badly, or am I missing something here? I asked Councillor Weldon in the last Executive Meeting why Mr. Webb, Director of CYPD, had so many outside interests (is it 10? I lose count). If he is paid £100,000 to do a job at Stockport Council that is the job he should be concentrating on and not some glorified career enhancement plan of his own. Councillor Weldon said what a wonderful job Mr. Webb was doing. I can only assume Councillor Weldon had not read the Council Plan, which was on the agenda for that very meeting. Add to this that it is CYPD which is paying millions over the odds to put a school on a former toxic dump, with no room to hold a sports day, no room for a coach to enter the site for trips out and to the baths, no room for the number of pupils who currently need to attend, which will cause even more terrible traffic problems, no contamination investigation points dug over the proposed school site and the intention to protect children from contamination hotspots with prickly bushes (what happens when the plants take up the contaminents and lose their prickly leaves? ), that it is with CYPD that an innocent man's simple protest has led to him facing a prison sentence and that CYPD is failing autistic children and their parents, and we have a worrying situation that I am not prepared to turn a blind eye to. Would you let me know please what service improvements have been implemented as a result of these complaints? I am writing in response to your email below (ref 2054). The section of the report regarding the Council’s constitution applies to Councillors, not Council officers; therefore the question of ‘approval’ in this context does not apply. I have been reading the Executive meeting agenda for 3rd August regarding the Council's constitution. Apparently appointments to outside bodies have to be approved. My question is: Who agreed to Mr. Andrew Webb being on so many outside committees, bodies, think tanks etc? Please list each appointment and who agreed it. Mr. Webb is head of a directorate which by the Council's own assessment is not meeting a large number of performance indicators. My feeling is that if he is highly paid to do a job he should concentrate on that and not on other career-boosting activities. I am writing in response to your request for information below (ref 2055). As is commonly the case with senior, respected figures in UK local government, Andrew Webb (the Corporate Director, Children & Young People) currently performs one role of a national nature as an extension of his employment by the Council. This is as Deputy Chair of the Social Work Task Force – appointed by the Secretaries of State for Health and Children, Schools, & Families. The appointment was the subject of press releases by both the government and the Council and was featured in the national and local media. The role is time-limited as the Task Force is due to report to the Secretaries of State in the autumn and Mr Webb has estimated that it will take him away from Stockport for no more than 12 days in total. The principle of national involvement of this sort was explicitly approved in advance by the Council’s Appointments Committee; and the personal invitation from the two Secretaries of State was accepted only with the prior knowledge and support of the Chief Executive and Executive Councillor (Children & Young People). The Council is proud that the achievements and experience of one of its officers have been acknowledged in this way, and is pleased that the role offers the opportunity for the borough to benefit from being so close to the latest professional thinking. Other senior officers at Stockport perform equivalent national roles, or have done in the past – as do senior officers from many other councils. It is an accepted, well-established way of running a national system of local government. In the case of each officer, the burden of any extra work is kept carefully under review so that it does not impact adversely on Stockport. Mr Webb’s appointment to the Social Work Task Force is his only substantial external role. The Director of Children’s Services is required, by regulation, to contribute the development of partnership working and service development in ways which go beyond the traditional limits of the Council – each of which could be described as ‘outside roles’. Stockport Council is also fully committed to working with partners across Greater Manchester and within the North West – again creating ‘outside roles’, some of which are temporary, others becoming longer term. Mr Webb contributes to this agenda as appropriate, flexibly and in a way that benefits, rather than impacting adversely on, Stockport. The role of policy lead for youth crime within the ADCS entails no specific duties. Mr Webb is accountable locally for the Youth Offending Team and is therefore fully engaged in local and national debate with external partners about both current and future service development and of the impact on services of Government policy. It is in the interest of Children and Young People’s Services across the country that Directors and senior officers share information about best practice and the development of effective services. The Association of Directors of Children’s Services (ADCS) facilitates such debate and on the Association’s behalf Mr Webb will respond to press enquiries and ensure that the national debate continues to move forwards. Stockport Council is a partner, along with over half the local authorities in England, in Research in Practice (RiP). Partnership in RiP enables front line staff, managers and Councillors to take part in conferences, access practice information and contribute to research and its utilisation. The particular demands of the role of Chair of the Partnership Board (over and above the Directors of other partner organisations) are that Mr Webb will chair two meetings a year that he would have attended anyway, and has regular contact with the Director of RiP. There are no funding implications in the above and Mr Webb receives no payment for them. Both the above roles were undertaken in line with a decision of Council’s Appointments Committee and with the knowledge and support of the Chief Executive, and Executive Councillor (Children and Young People). Perhaps it could be clarified how many outside roles Mr. Andrew Webb currently or has during his time at SMBC held. I believe a FOI response was given that he had one. Looking forward to receiving the clarification. Thank you for your request for information, which was received on 4 August 2009. You requested to see any expense claims made by Andrew Webb, Director of Children's and Young People's Directorate at Stockport Council and a member of the Social Work Task Force. . I have dealt with your request under the Freedom of Information Act 2000. The Department has decided that the public interest lies in disclosing the information. If you are unhappy with the way your request has been handled, you should make a complaint to the Department by writing to me within two calendar months of the date of this letter. Your complaint will be considered by an independent review panel, who were not involved in the original consideration of your request. The Government is committed to taking forward a long term programme of reform for the social work profession. In 2008 the Secretaries of State for Children, Schools and Families and Health established a Social Work Task Force to conduct a ‘nuts and bolts’ review of the profession and to advise the Government on the shape and content of a comprehensive reform programme for social work. Andrew Webb, Director of Children’s Services in Stockport was appointed Joint Deputy Chair of the Social Work Task Force. Your correspondence has been allocated the reference number 2009/0069131. "On behalf of Stockport Council, I would like to offer a sincere apology to all parents, carers as well as children and young people who have been distressed by recent changes to travel arrangements. The changes are a result of attempting to promote independence in young people as well as bringing expenditure in this area in line with other Councils similar to Stockport. The first phase of the changes since September 2010 enabled many young people to gain a greater degree of independence. This was celebrated at an event held on 18/06/12. However, the recent attempt to apply more rigorously the local policy relating to the distance from home to school has proven to be inappropriate in the majority of cases. At the same time, the recent round of contract procurement arrangements has meant that there are unavoidable changes to some travel arrangements for the new school year. This means that there are some changes to who provides the transport and the type and size of vehicles used. The Travel Coordination service has committed to monitoring very closely the ways the new arrangements are working and will be arranging further meetings with families from September on the new transport arrangements. The primary aim of these meetings will be to listen to the views of parents/carers and young people where possible about the service and future plans. We hope that these meetings will enable us to avoid a repeat of the recent upset that has been caused and to move forward productively. The Council would wish to continue to promote independence through ‘Independent Travel Training’ and to work with parents and carers in assisting with travel arrangements. However, every attempt will also be made to recognise individual circumstances, particularly in relation to children and young people with the most complex needs. Please feel free to contact the Travel Coordination Service on 0161 249 4450 if you wish to discuss any issues related to this statement. "But Andrew Webb, director of children's services at Stockport Metropolitan Borough Council, says more regulation is unnecessary. "I think local authorities should determine issues concerning the practices of their own social workers. Only if the authority is concerned should they refer it to the GSCC," he says. [Children & Young People Now 19 February 2009 ]"
Join us at our flagship conference for everyone working in child protection. Hear from high-profile speakers including Children’s Minister, Edward Timpson MP and incoming ADCS President, Andrew Webb. Find out about the latest developments in policy and cutting-edge practice. For more information, visit www.nspcc.org.uk/safechildren"
Why anyone would want Andrew Webb's advice on anything at all is beyond me!